Hi all. So I've just moved house and have a stone/concrete built 'summer house' in the garden with tiled roof, windows and patio doors fore and aft. It's a decent size and I plan to set my acoustic kit up in it. Now, I have no aspirations for sound proofing as it's not feasible but I wonder if there was anything I could do that would help reduce the volume? I've got the Remo Silent Stroke skins for Christmas which I know will take care of a lot of noise, but I'm not forking out for the quiet cymbals (yet, they may prove to be the cheapest-to-benefit option in the end), so I would still have cymbal volume. Ultimately, with silent skins and cymbals, the noise issue will be gone (I assume!). Silent skins but with normal cymbals, I'm unsure of yet but as the cymbals are trebly, they may not present too much of a noise issue, although it may be jarring when practising to have quiet drums and noisy cymbals. Ideally, I would like to use the proper skins and cymbals for obvious reasons. any good at all or worth the expense? Is there something else that could be put up/taken down as required that would help reduce the overall volume? I've had a brief look round the forum but everything seems to be centred on sound proofing, which I don't need. I'm a good 30 metres from the house (downhill from the house too) and about 20 metres from a neighbouring property (with some tree/fence shielding between) so I'm just trying to contain the noise to being barely, if at all, audible from those places more than I am having silence from the summer house. I think you'll find playing with silent stroke heads and real cymbals will prove very annoying, the cymbals will be a LOT louder than the drums. 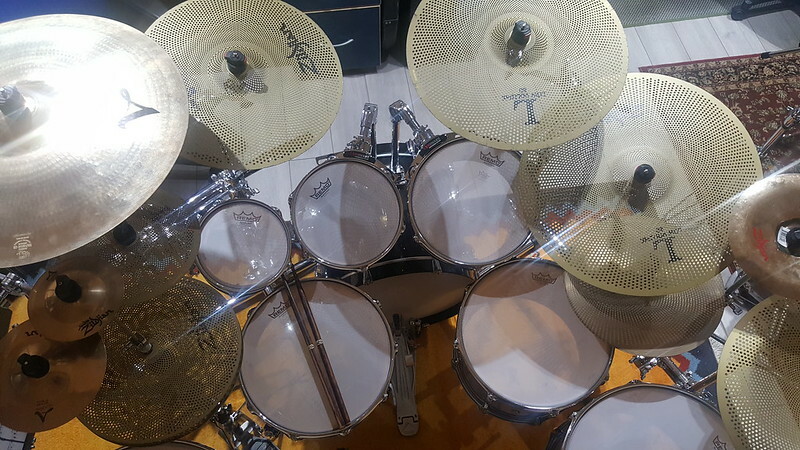 I'd focus on reducing the volume of the cymbals, you could try some cloth over them, or sound reducing pads, these options will alter the feel of the cymbals but could prove cheap and effective. Those drum screens are extremely expensive and won't solve your problem - if anything they could make it worse as the high pitched cymbal noise will reverberate inside the chamber and make things louder. I'm using silent stroke head and Zildjian L80 low volume cymbals on my main kit which is in a log cabin in the garden, from outside the cabin you can barely hear anything and inside its possible to be playing and holding a conversation without raising your voice. Another option if you don't want to be swapping drum heads is the RTOM black hole mesh pads which clip on to the drum, however they're not cheap. Thanks. How do you find the L80s? Getting a bunch of those will still be quite a lot cheaper than the screen. L80s aren't cheap but will be cheaper than the screens for sure. The L80s are a decent compromise - not perfect - they have a different feel and sound to normal cymbals but you soon get used to them. The alloy is different, its thicker and less dense I think but with all those holes in, it reacts differently with the drum stick. I have the full complement as you can see above, but I rarely use the splash or china. I'd say the 14" hi-hats, 20" ride, 18" crash-ride and 16" crash give a very good practice set, that's the 468 set plus the 20" ride.